Human activities are primarily classified into two categories, i.e. economic activities, and non-economic activities. Economic Activities are the activities conducted with an aim of earning money or livelihood. Further, these activities are sub-divided into business, profession and employment. There is a huge difference between business and profession in the sense that there is no minimum qualification required for starting a business. It means an activity that is related to buying and selling of goods. On the other hand, a profession is nothing but a paid occupation that requires a person to be formally qualified, expert and trained in a particular field to be called as a professional. Take a read at this article to know more on the two topics. Meaning Business is an economic activity concerned with the production or purchase and sale of merchandise and rendering of services with the purpose of earning profit. Profession is a form of economic activities, wherein special skills, knowledge and expertise is required to be applied by the person, in his occupation. Establishment On the decision of entrepreneur and fulfillment of legal formalities. Membership of the respective professional body and certificate of practice. Qualification No minimum qualification. Specialized knowledge of study is required. Capital Required as per the size and nature of business. Limited capital is required. Code of conduct No prescribed code of conduct. Code of conduct prescribed by the professional bodies needs to be followed. Advertisement Products and services are advertised to increase sales. Advertisement is prohibited as per professional code of conduct. ‘Business,’ a term which has its origin from the word ‘busy,’ that refers to the act of being busy. In simple terms, business is the regular occupation of a person in which they engage in an activity to earn the profit and acquire wealth. Production or purchase and sale of goods and services on a regular basis. 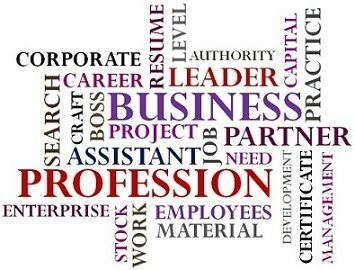 The profession is defined as a paid occupation in which a person is formally qualified and has undergone prolonged training, render services to general public. It refers to any activity that requires expertise in specialised knowledge and skills acquired by way of formal learning and practical experience, to be applied by the individual in their respective occupation. Some common examples of the profession are Doctors, Lawyers, Chartered Accountants, Engineers, Architects, etc. To be called as a professional, a person should be a registered member of a profession. In every profession, there are certain rules called as the professional code of ethics; that governs it. The purpose of a profession is to provide services to those who need it, for a direct and certain compensation called fee. An economic activity concerned with the production or purchase and sale merchandise and rendering of services with the purpose of earning profit is called business. A form of economic activities, wherein special skills, knowledge, and expertise is required to be applied by the person, in his occupation is known as the profession. The primary objective of a business is to earn profit whereas profession is aimed at providing services. A business can be established by the decision of the entrepreneur and after fulfilling certain legal formalities. On the other hand, profession requires membership of the respective professional body and certificate of practice, for the establishment. Any person can start his business; there is no minimum qualification to run a venture. On the contrary, specialised knowledge of study, training and expertise is the major requirement for the profession. A business requires capital investment according to its size and nature. Unlike, profession whose capital requirement is limited. A businessman gets profit as a return for the work done by him/her. Conversely, a professional gets a fee for the services rendered by him/her. In business, there is no prescribed code of conduct. As opposed to the profession, the code of conduct is prescribed by the professional bodies which must be followed. In general, every business advertises its products and services, for the purpose of increasing sales. As against this, the advertisement is strictly prohibited as per professional code of conduct. In business, transfer of interest is common, like transfer of business by the father to his son. In contrast to the profession, where transferability is not possible as it requires specialised skill and knowledge. Business and risk go hand in hand, so the risk factor is always present in business. On the other end, the risk factor may or may not be present in a profession. After a broad discussion on these two topics, it is quite clear that these two are not same at all. Business is primarily set up to make a profit and acquire wealth, while service is the basic motive of a profession. Further, business requires huge capital investment, at its initial stage. Conversely, the actual capital is the competency and specialisation in the profession.